Though video games based on professional wrestling have existed since the 80s, it was during the emergence of 3D consoles with the Playstation and Nintendo 64 that saw wrestling games become the genre they are today. With 3D graphics, video games could more accurately capture the look and feel of a professional wrestling match. This couldn’t have happened at a better time, as pro wrestling was at the peak of its popularity during the “Monday Night Wars” between WWE (then WWF) and WCW. 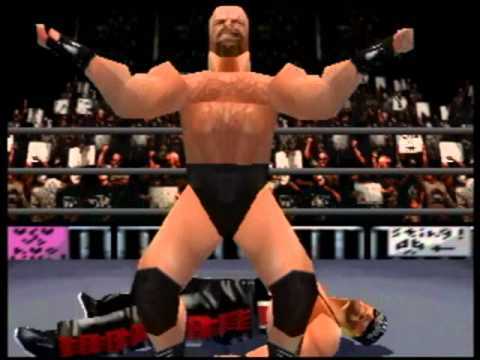 One of the games to come out of this boom for wrestling titles was WCW/nWo Revenge for the N64, which proved to be a groundbreaking title in the genre, though age hasn’t exactly been kind to it. WCW/nWo Revenge tried to make the mechanics of wrestling games more accessible. Grapples were handled through the A button, while the B button performed strikes. Pressing different directions on the D-pad while pressing those buttons would alter which moves your wrestler performed. Though a bit crude by today’s standard’s, these simplified mechanics laid the groundwork for today’s wrestling games, which have built on them and smoothened out the rough edges. On the downside, moving your wrestler is also used with the D-pad, while the joystick performs various taunts (why it wasn’t the other way around is a mystery). Pressing the Down-C button makes your wrestler run, which makes for some clunky running mechanics. 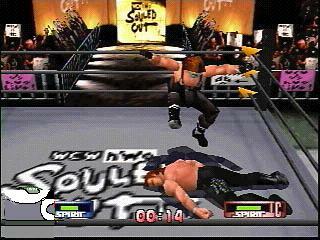 Players can take control of a large array of WCW wrestlers from the time, from icons like Sting and Bret Hart to lesser known wrestlers of the day. On the plus side, players can alter the costumes, colors and names of every wrestler in the game, which served as a precursor to the create-a-wrestler features we see today. Unfortunately, you cannot alter any of their movesets. The game features a short list of game modes. Championship mode sees players taking on a number of wrestlers as they hunt for one of WCW’s titles, and unlock the belt and its holder upon defeating them. Exhibition matches are standalone bouts where the player can customize rules. Handicap matches place one wrestler against two. And the highlight of the package is the battle royal, where four to forty wrestlers all do battle, with four in the ring at a time and a new wrestler coming in once an elimination has been made. Admittedly, it’s not exactly a whole lot of variety, especially when compared to contemporary wrestling games. But if you have some friends over and are feeling nostalgic, it can provide a quick round of laughs. For its time, WCW/nWo Revenge was actually a good wrestling game, but age has exposed how prototypical it was. There are no button cues letting you now when to reverse an opponent or resist a submission, the controls feel stiff, and there’s a lack of variety in modes and moves. Not to mention the game’s lack of the wrestlers’ actual theme music, which means they enter the ring to a short list of generic tunes. It also goes without saying that the graphics haven’t aged gracefully. As a wrestling fan, I can still appreciate what this game did for its day, and I have fond memories of it. But it would be a lie to say it’s withstood the test of time. Those who wish to revisit the days of WCW may find a few brief minutes of fun with some friends playing WCW/nWo Revenge. But truthfully, you’d have a more enjoyable time with a more recent wrestling title and simply recreating WCW’s stars with the create-a-wrestler feature. Generally speaking, it seems like most of the early 3D games haven’t held up as well as the later 2D ones. Though as you pointed out, the exceptions, such as Ocarina of Time, have aged remarkably well. It looks like this game is not one of those exceptions. It’s interesting how professional wrestling games simulate the competition as though it’s a legitimate one. Though one theory I came up with for how it makes sense in-universe is that the outcome is planned like it is in real life, but the backstage meeting to determine who is supposed to win and what is to take place is not shown to the player. Therefore, the details in the meeting are unknown until you finish the match; at that point, they change to reflect whether or not you won (i.e. if you win, you were told to win in the off-screen meeting and the same holds true if you lose – think Schrödinger’s cat). That is actually a very good theory! I think today’s wrestling games have somewhat borrowed that mentality, now that they include modes where you play the role of booker and even modes where you can write an entire story! Generally speaking, 2D games are just more timeless than 3D ones. The N64 is certainly no exception, but strangely, the ones that do hold up do so at an extreme level. Arrrrrr man! The one wrestling game I liked as much as No Mercy! Can’t remember the characters name but I renamed him Night Fever Lepo, and remade him in every wrestling game after.